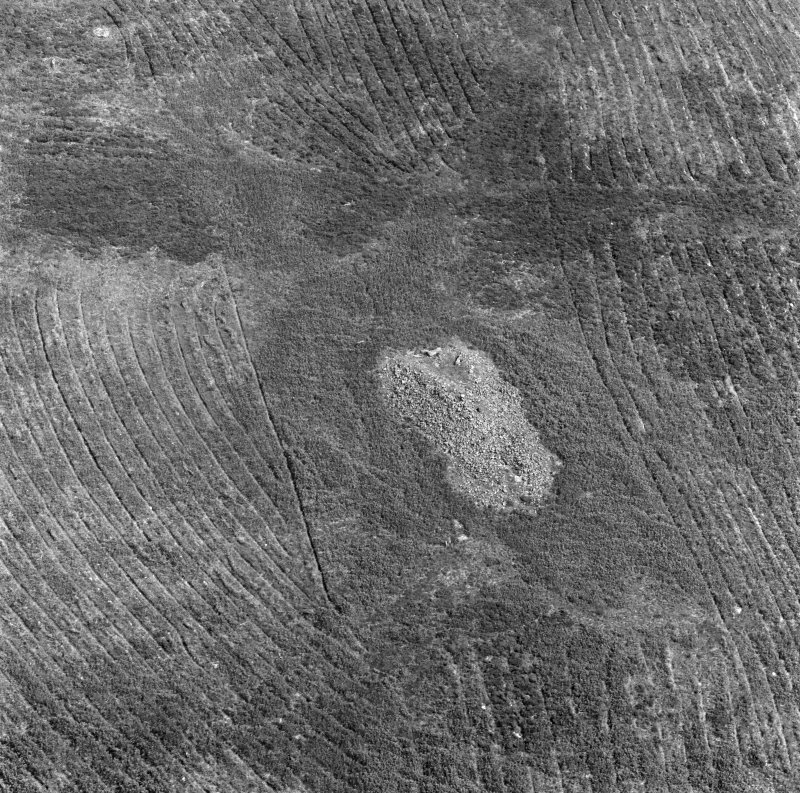 Oblique aerial view centred on the chambered cairn at Carn Ban, Arran. 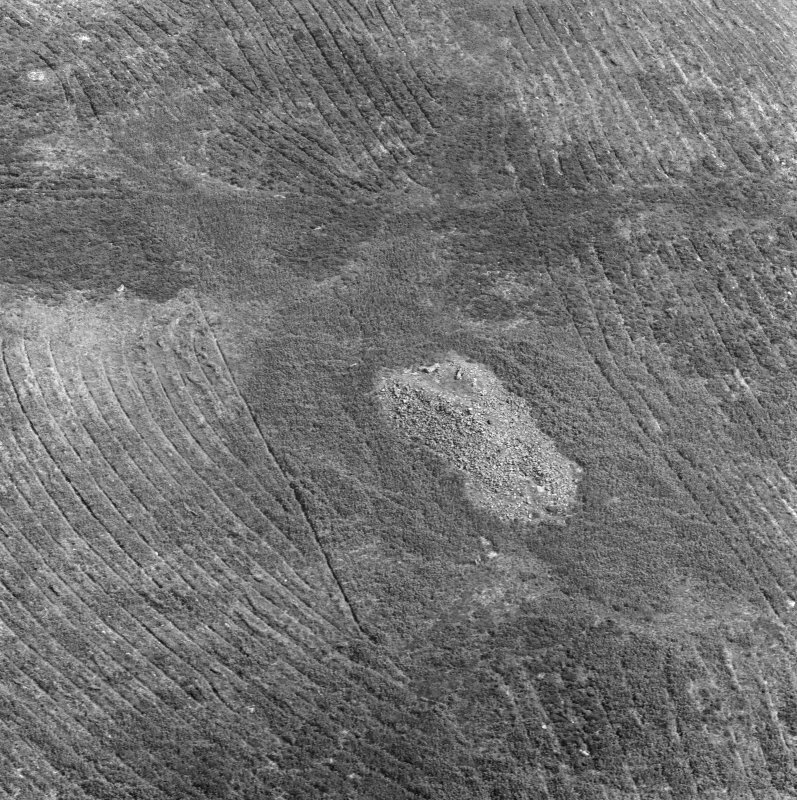 Carn Ban: Clyde group, long cairn: This cairn of bare stones is roughly rectangular in plan, about 100 by 60 ft. At the upper, NE end, there is a semicircular forecourt edged by square-ended horns. At the lower end the cairn is about 15 ft high; at the back of the chamber it is about 12 ft high, but at the NE end it merges into the rise of the hill. 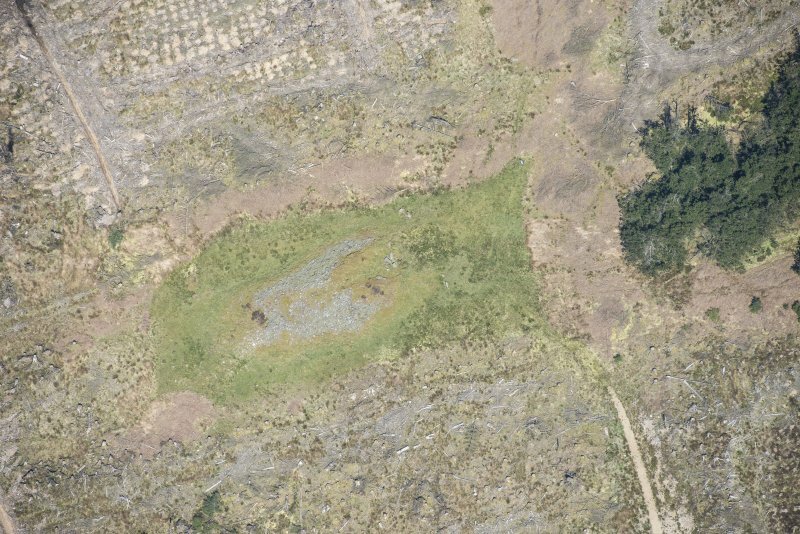 It is evident that much earth and stone has weathered out of the hillside above the cairn, and has accumulated in the dip between the hill and the end of the cairn, especially in the forecourt, almost entirely burying the orthostats and producing a level turf-covered area. 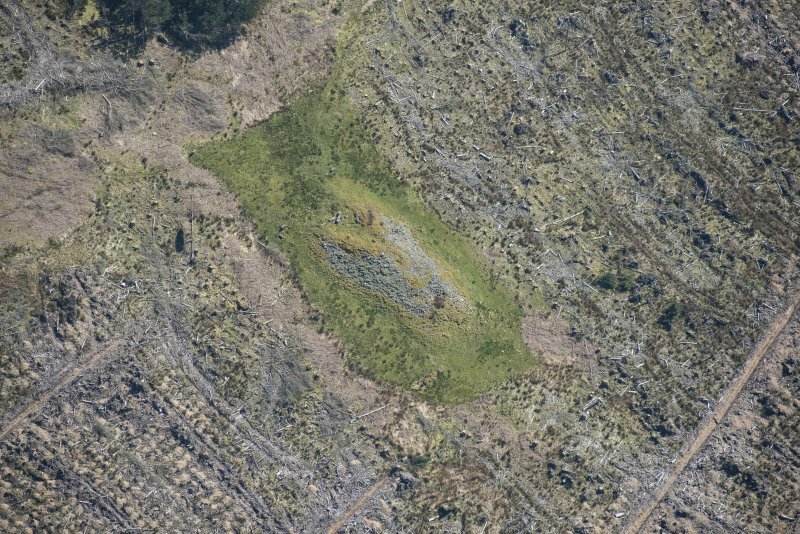 The end of each horn is marked by two upright slabs; at present cairn material is not visible to the ends of the horns, and though it doubtless exists below the vegetation, it evidently never reached the tops of the orthostats. 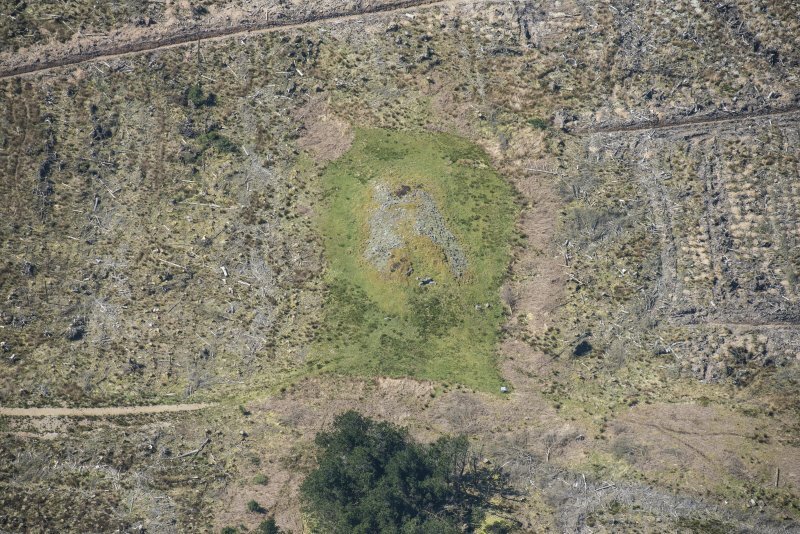 On the NW side of the N horn there is a stone about 3 ft high, aligned down the NW side of the cairn. 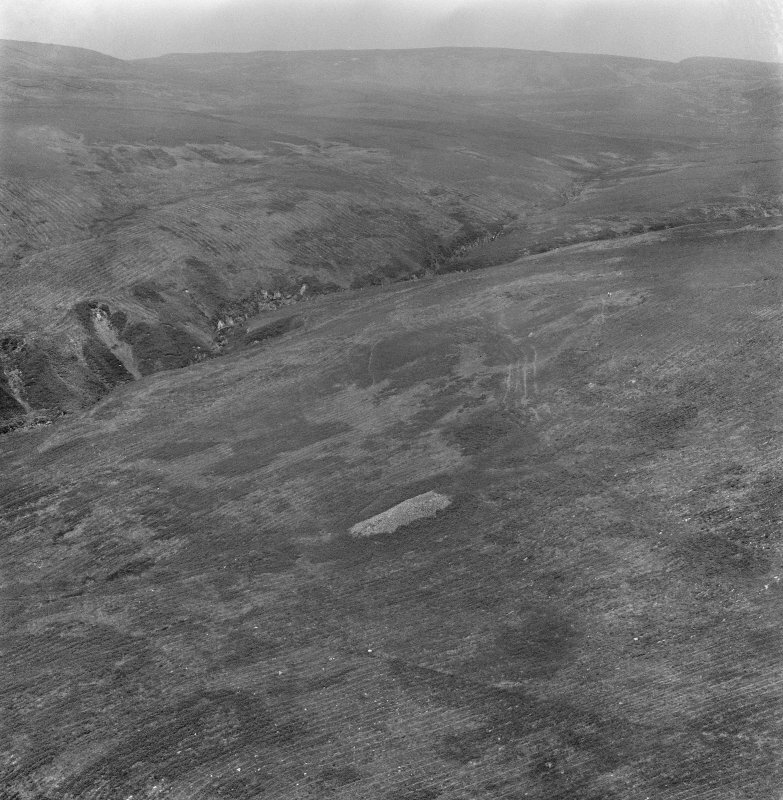 It gives a width of about 14 ft to the horn, and suggests a peristalith, but in 1902 when Bryce dug into the side of the cairn near each end he found no built edging. The forecourt measures 34 ft across by 20 ft deep. Six stones can be seen, spaced irregularly, and evidently several more are hidden. A stone to the N of the SE horn appears to be deliberately set, and projects 6 ins. It would lie roughly on the line of a continuation of the facade into a circle. 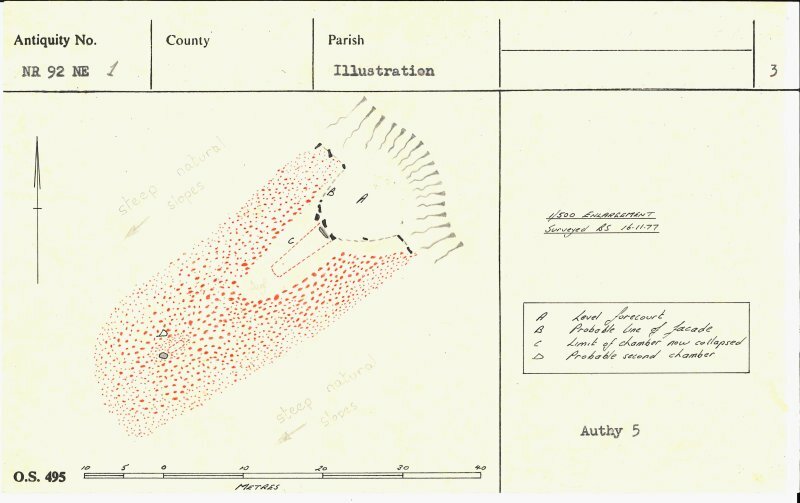 The ONB describes "clear traces of a circle about 40 ft in diameter marked by stones varying from 1 ft to 2 1/2 ft in height", and 1st edition 6" depicts a complete circle of dots. The chamber, which is 18 ft 8 ins long, divided into four compartments, was filled in again after Bryce's excavations. It was found to be filled with loose earth and stones, some of large size. The bottom of each compartment was covered by a 2 ins thick charcoal layer. The only finds made, now in the NMAS, were a flint flake, a pitchstone flake, and an unburnt fragment of human bone (Acc No EO 270). A fragment of burnt bone also found is now lost. At the SW end of the cairn, several stones are exposed, suggesting the presence of a second chamber entered from the SW end. At the W corner of the cairn lie 3 flat slabs which seem to be pieces of one broken stone. This probably stood upright at or near the corner of the cairn. A flint scraper and a box of flakes and chips, mainly flint, but some pitchstone, found near Carn Ban were donated to the National Museum of Antiquities of Scotland (NMAS) in 1969 by the Forestry Commission (Acc Nos: AB 2922-3). NR 9910 2620. Carn Ban (name confirmed on DoE nameboard) situated on a steep south-west facing slope is generally as described by Henshall. It is now in a forest clearing partly grass covered and in a decayed state. The chamber is filled with debris. Surveyed at 1:10 000 and 1:500. Visited by OS (BS) 16 November 1977. 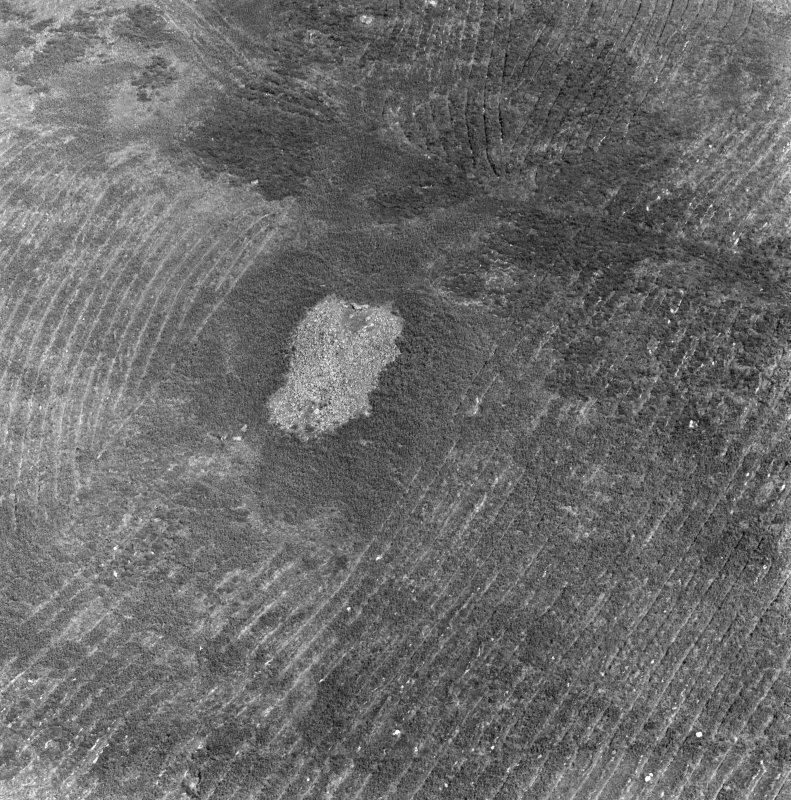 Oblique aerial photographs of the chambered cairn at Carn Ban, Arran, taken by John Dewar in 1970. 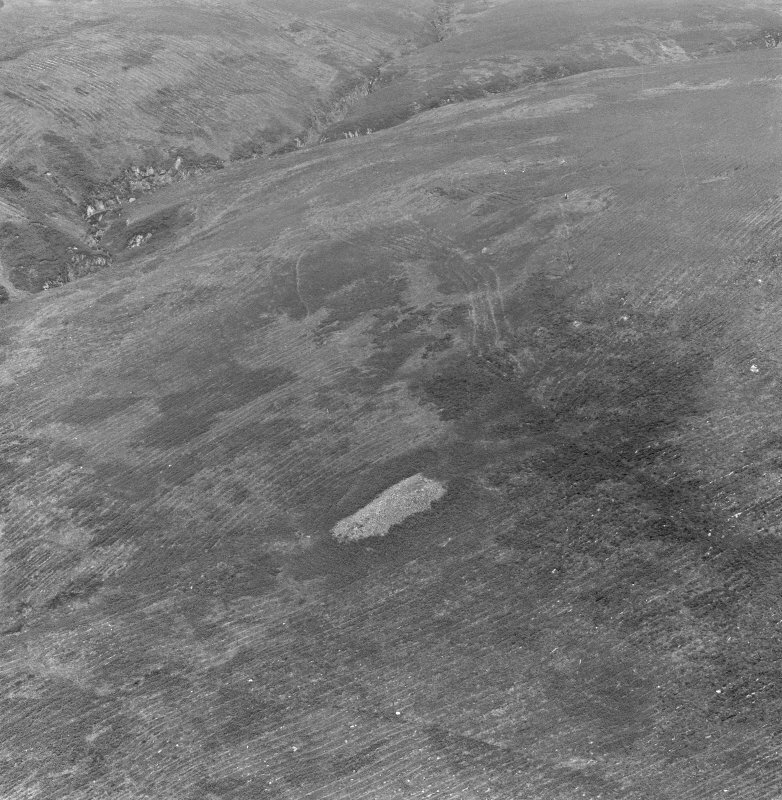 This trapezoidal Clyde-type chambered cairn is situated on sloping ground at a height of about 275 ID. Its location in so remote a spot is unusual for the chambered cairns of Arran, as the majority are found close to arable ground, but its very remoteness has helped to preserve it from the depredations of stone robbers, and it remains one of Arran's best-preserved neolithic cairns. 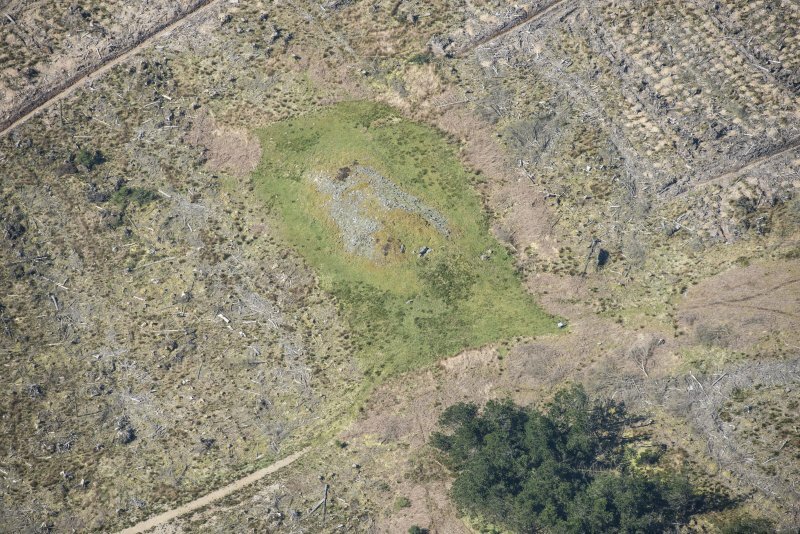 The cairn, which is aligned north-east/south-west, measures about 30m by 18m and 4.5m in greatest height; at the north-east end there is a semi-circular forecourt flanked by two square-ended 'horns' projecting from the main body of the mound. At the centre of the forecourt a pair of portal stones marks the entrance to a chamber, which, before excavation in the late 19th century, still remained intact-Cam Ban was the only neolithic cairn on Arran to retain its roofed chamber. Unfortunately, the roofing lintels have now collapsed, although one can still be seen lying nearby, but the chamber was about 5.6m long with four compartments, each separated by a septal slab, and it stood to the considerable height of 2. 7 4 ID. At the centre of the south-west end of the cairn, and in line with the main chamber, there are several stones which probably indicate the position of a second chamber. 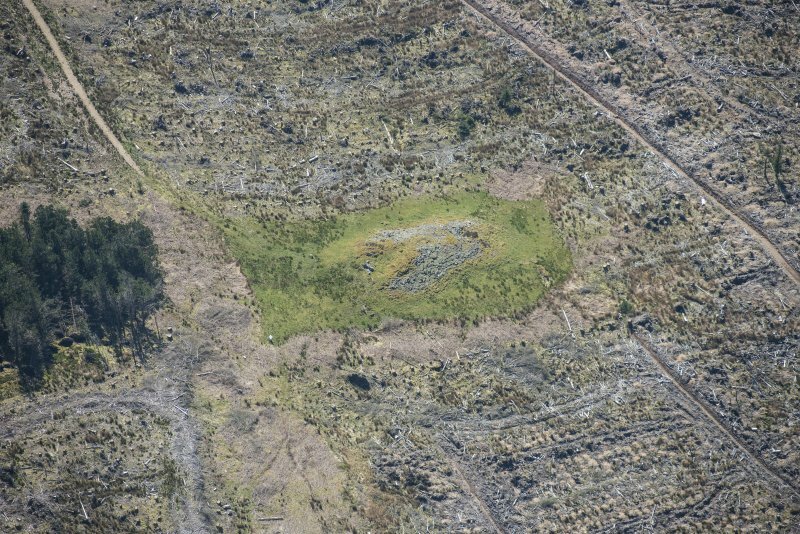 Such additional chambers are comparatively common features in chambered cairns, and either they are inserted to accommodate secondary burials, or they mark an earlier phase in the development of the cairn in which a primary mound (with its chamber) has been incorporated into a greatly expanded cairn. At Cam Ban there is no evidence to suggest which is the case, and only a properly controlled excavation will be able to reveal the answer. In terms of finds, the 19th century excavations were rather disappointing; the only objects recovered were two flakes, one of Arran pitchstone and the other of flint. The acid soil conditions had reduced any skeletons present to a single fragment of a long bone and a burnt piece of possibly human bone. 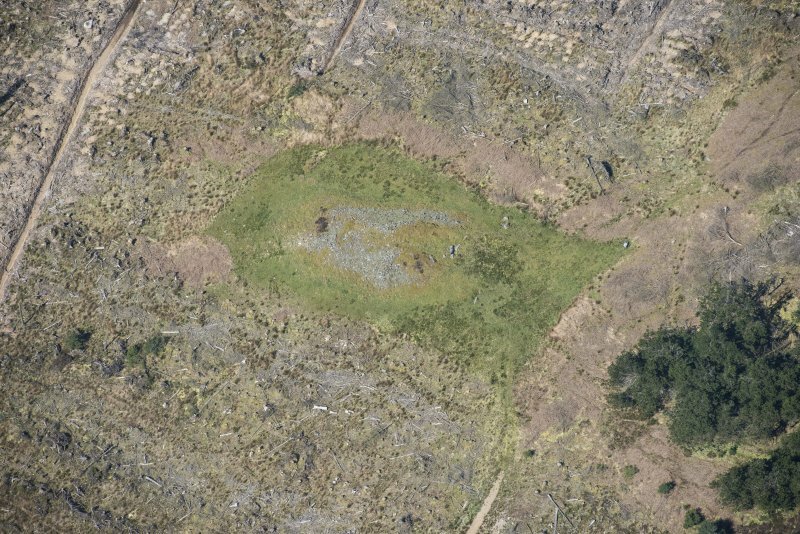 AOC Archaeology Group undertook a survey of seven chambered cairns and one four poster stone circle on Arran was undertaken for the purposes of providing a baseline record, for conservation management and for archaeological study.